If you are looking for an opportunity to be financially free here in Nigeria, mini importation is one of the businesses you should consider. The good thing about this business is that you can start with a little capital, as little as N10,000. As a matter of fact, when I started my mini importation business in 2013, I started with less than N10,000. I bought a medical equipment which sells over N15,000 in Nigeria at that time. Guess how much I bought it from a website in China, I bought it less than N4,000, including shipping fee. I was able to buy two pieces of the equipment. And guess how much I sold them in Nigeria. Other marketers were selling the same equipment for over N15,000 at that time. I want to sell my very quickly so I sold each for N11,000, making a profit of over N7,000 for each of the item. That's how much profit you can make from mini importation, if you know the right products to import and how to sell them. That's exactly why this post is written for you to learn. Another beauty of this business is that you can do it on a part-time basis, without interfering with your regular job. In this tutorial, you are going to learn everything you need to know on how to get started. But before I go into details, let's how some background information. Mini-Importation as the name implies; is a process whereby you buy items outside the horizon of your country, bring it down and sell to your customers. When most people hear the word "Mini - Importation", the first thing that comes to mind is "A Truck Load of Container to Throw in (Like an Igbo man), they seem to forget the word "MINI" before the "IMPORTATION". "MINI" means SMALL, so when we talk about mini importation, we are not talking about HUGE items neither are we talking about a container load of items. Rather we are talking about light items you can buy on a small scale and ship them easily to Nigeria. Most of these items sell at a ridiculously low price outside Nigeria. But when they are brought in here, our Igbo brothers sell them at an exorbitant price for you and me. So what I'm talking about here is a process whereby we import small items which are very cheap over there, bring it here and sell it at a KILLER PRICE. Can you imagine selling what you bought for let's say less than N500 for about 10,000 and people are matching themselves over to pay for it? That's what happens in the world of importation business. Most of the things we bought for a huge price here are sold for chicken change outside Nigeria. So, count yourself lucky to have come across this web page. What you are going to learn here has the capacity to revolutionize your life and family if you apply it. In Mini Importation, there is the elimination of middlemen such that there's the movement of goods directly from the manufacturer to YOU (You can call yourself both the Retailer and the Consumer; but in this case, since we're talking about importation, the appropriate description for you should me retailer. I'm very sure you want to engage in mini importation so you can sell for others and make a profit). I know at this point, you're already catching the BREEZE and Eager to Join the League of Mini Importers. But Let me be plain with you: The road is not as swift as you might think. You've got to go ALL OUT if you must succeed in Mini-Importation. Let me throw in a little bit of clarification here before we proceed. One of the countries where we will import our goods from is China. Well, you might be telling yourself " China products are substandard, counterfeit or fake". Well, I used to think in that direction before. But not anymore! To prove my point, let's do some analysis here. You might not be aware but the truth of the matter is that 70% of the products in the world are manufactured in China. Probably the phone or laptop you are using to read this web page now is manufactured in China. Truth be told, 90% of the phones we use in Nigeria are made in China phones. The wristwatch you're putting on right now is made in China.....80% of the items in your home are made in China. Now, let me use myself as an example. The shorts I'm putting on right now is made in China, my earphone I'm using to listen to music now is made in China, my mobile phone and even my laptop I'm using to type this information are all Made In China. China is the number one source of all those hot-products you know today. And so, the question is, "Why is China the manufacturer of almost every gadget we use today?" As an answer to the above question, China, due to their large population, is one of the cheapest sources of labor in the world today and as a result, big brands like HP, Apple, and big names in the industry make their products through factories based in China. To ensure the quality of their products are not compromised, the US and European countries set very strict standards which the Chinese have no option but to comply. Why am I telling you all this? It’s because many people in Africa have come to the conclusion that Chinese products to be low quality. As a result of that, you hear us using degrading words like "Chinco" to describe Chinese products. Now, the problem is not the Chinese manufacturers per se, but the problem is the greed of our businessmen and women, or probably the poverty level of the African nations. What our business people do is to go to China and demand the manufacturers to produce a low product quality that most of us can afford. As you'll agree with me, almost everybody owns a mobile phone today because of the proliferation of Chinese made phones. This is because their product normally sells for lower prices than similar products that are made in the US or other European countries. It's not as if the Chinese man cannot make a product of high quality. He certainly can! Just like the US and other developed countries, if our governments could enforce strict quality and safety standards for products coming into Africa, the Chinese would comply as they do for their clients in the USA and Europe. Now that you have known these things. What categories of products should one import from China? Remember that we are talking about Mini Importation here. We go for items that can easily be shipped down to us within a few days, possibly within 24 hours. Yes, you got me right - - 24 hours! There are some items that can ship as fast as that. Let me divide the products you can order to different categories. always run away from Heavy/Big Products. Category 2. Import what you can easily sell and don't go for what YOU desire, rather go what people desire. Importation Business is not just the amount I am able to make but the SOLUTION I can bring to the table. What are the challenges that your pràoduct can solve? When the above become the center of your business, you will build a formidable business that is highly rewarding. If you go into this business or any endeavor for that matter with solution-oriented mind, every obstacle becomes an opportunity. Approach importation as a normal business that you need to learn more and take action on the knowledge acquired. From my years of experience, sourcing to getting customers will be easy for you if you are determined to solve people's challenges. Plan to solve a problem today with your importation business. Go out there and look for the needs of the people, once you identify them come back and search for products that can meet those needs. Let me tell you that the rich does one thing better than the poor, the rich see opportunity in challenges and we pay them to solve it while the poor always complain about challenges and blame others. To be rich has nothing to do with age or background it is a mindset that you need to have. Recall that we are going to be importing from China. Does that mean we are going to travel to China? Certainly NOT. Technology has simplified the life of man today, that almost everything can be done using technological gadget. In our Mini Importation endeavor, we are going to shop and order for items of our choice online and get them delivered to us here in Nigeria. We are going to shop on a special Chinese website. But the problem of this site is that it is written in the Chinese language. So how do you shop there when you don't understand the Chinese language. Another problem is that some products there are substandard products, how can you identify them and avoid them? Lastly, some people that pretend to be sellers on the platform are scammers, how can you identify them and so you don't fall prey? That is why I am here to guide you on how to identify quality products, how to get the best price (more value for your money), how to calculate capital costs and estimate profit, how to sell your imported goods easily here in Nigeria using E-commerce sites so you don't lose money as well as how to sell on your own. Connect you to a Chinese procurement agent that will help you buy your goods so you won't lose money (remember I stated above that the website is written in Chinese language, so you need an agent that understand Chinese to shop for you). I will give you a reliable shipping company that will ship your goods to your country at a cheaper rate in a matter of 1 to 10 days. How much does it cost to learn all of these? 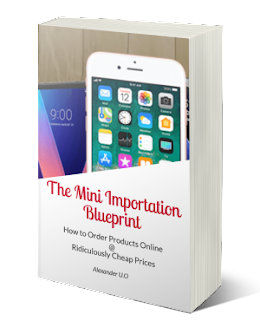 All it will cost you is to order the Advanced Mini Importation Guide titled The Mini Importation Blueprint. 2. After payment, send an SMS with your payment details (Name, date of payment, email, the amount paid and item paid for) to 08187664783. 3. Once your payment is confirmed, you will get a download link to the book within 24 hours. To get instant access to download the ebook, make payment with your ATM card using the button below. 1. You Will Sell Your Imported Goods on My E-commerce Website for FREE for One Month: Yes, you got me right. I run an e-commerce website where I sell my imported goods. You can check the website here: http://www.delightshop.com.ng/. You will create an account on the site and sell your products there free of charge for one month. After the first one month before you start paying. 2. I will create a Facebook Page for you free of charge: I am a web developer myself, if you buy this mini importation guide, I will help you create a Facebook page where you can market your imported goods. I will teach you how to use Facebook to advertise your goods and make fast sales. 3. If you need a website like my own above, I will create it for you at a reduced price, a 10% discount for the development fee. Take Action Right Away. The Best Time is Now!